I am a huge fan of Tokidoki and Hello Kitty, and this season, Sanrio's teamed up with Tokidoki to release a series of awesome products! 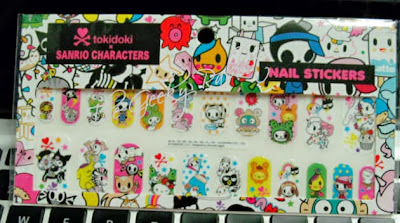 Not all the items are out, so I managed to only get the nail sticker. 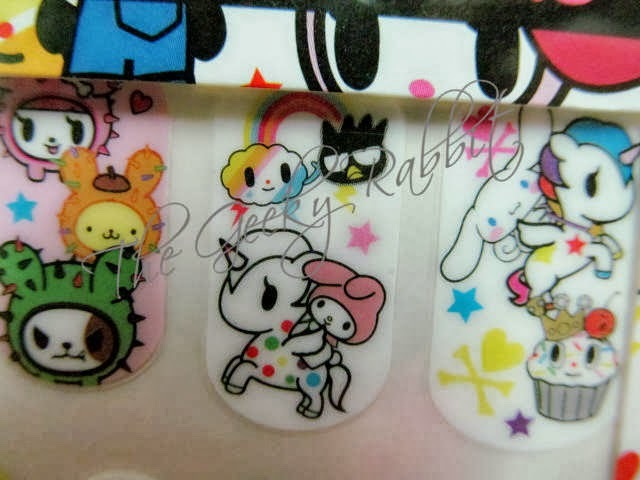 There were three designs of nail stickers but I only picked up one. It has various Sanrio characters with the tokidoki characters. My favorite are the ones with Maru, Purin and Cinnamon. It's also interesting to see how the characters are infused with the tokidoki 'costumes', as previous collections mainly featured Hello Kitty! Many of the new Unicornos are also featured! I'm definitely looking out for the new items that are slated to hit the shelves very soon (estimated November release date). Can't wait!